Zhang Jianzhu, 59, has long worked as a bricklayer at construction sites in Xi'an, capital of northwest China's Shaanxi Province. This year, however, he feels his health is worsening. The man lives in a room less than 10-square-meters in size. After a day's hard labor, he has a sore waist and an aching back. "I'm too tired to move forward any more. I've made up my mind not to take any more jobs after this one is completed," he said. Zhang came from a farming family in Heliu County of Weinan City in Shaanxi. Since 1977, he has toiled away at all kinds of odd jobs in various cities to support his family in the countryside. He is always too busy to go home to help his wife farming. Like the fallen leaves that return to their roots, the old man has finally decided to go back to live in his hometown after 40 years spent outside working as a migrant laborer. 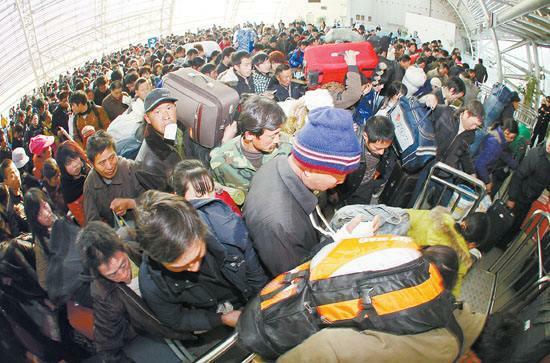 Statistics from the Ministry of Human Resources and Social Security show that migrant workers born in the 1980s now account for more than 70 percent of China's total migrant population, while those born in the 1950s are retiring from the country’s main labor force. In Shaanxi Province, there were a total of 7.1 million migrant workers in 2016, an increase of 5.2 percent over the previous year. Migrant workers born in 1980s accounted for 53.7 percent of the provincial total. Zhang is among the first generation of farmer-turned migrant worker that began emerging in the late 1970s when the country implemented the reform and opening up policy.These people have witnessed great changes in China’s urban and rural areas in the past four decades. Similar to Zhang, Liu Tianren had been away from home for 35 years working as a construction worker in cities until last year when he was persuaded to retire and was taken back home by his son. Liu participated in many construction projects in cities such as residential buildings and supermarkets. Years of city life helped transform Liu from a peasant of few words to an experienced worker with good social skills. He knows well how to handle the relationship with his bosses and co-workers. "It does me good to work in the cities and has widened my horizons," he said. Liu has a good impression of city dwellers, saying they are warm-hearted and hospitable. "I get along well with them. They even invite me to visit their home and have dinner with them." What makes Liu feel most proud is that the money he earned in cities has supported a big family in the countryside – his wife and three daughters. All the migrant workers long for is a peaceful life in old age. However, the unexpected always happens in life as well as in nature. Li Yanjiang, 50, was diagnosed with first-stage pneumoconiosis four years ago. He had to say goodbye to the mine where he had worked for 27 years. After a period of treatment in a local hospital, he returned to his home in Jiehe Village, Zhen'an County of Shangluo City to recuperate quietly. Pneumoconiosis is one of the major occupational health problems in China affecting an increasing number of migrant workers working in a dusty environment like mines and construction sites for a few years. Li was one of the 120 pneumoconiosis patients in his village where there are a total of 980 households. From 1986 to 1990, one after another the villagers flocked to work in gold mines in Sanmenxia City of Henan Province, coal mines in Jincheng, Datong and Linfen cities in Shanxi Province, and iron ore and coal mines in Hebei Province and Inner Mongolia Autonomous Region. The proportion of migrant workers among pneumoconiosis patients was as high as 90 percent, according to an investigation on the health status of migrant workers in 2016. The investigation was conducted by the Love Save Pneumoconiosis, an organization under China Social Assistance Foundation (CSAF) and its sponsor is Wang Keqin. In January 2016, the Opinions on Strengthening the Prevention and Treatment of Pneumoconiosis Among Migrant Workers was jointly issued by 10 ministries including the National Health and Family Planning Commission, National Development and Reform Commission, and the Ministry of Science and Technology. The document proposed that afflicted migrant workers be included in national medical care programs to enjoy subsistence allowances. As the Chinese saying goes, in the Yangtze River the waves behind drive on those before; so in migrant workers, the new generation excels the old. He Mingliang, 26, came from a small village in Ankang. He runs a mobile phone repair shop in a community in downtown Xi'an. Due to his great skills, good service and reasonable price, his business is brisk and well received by locals. He came to Xi'an seven years ago after graduation from a college in Ankang. Being diligent and eager to learn, the young man now has a successful career, a happy marriage and a sweet home in the provincial capital. While elderly migrant workers are most concerned about money issues, the new generation of migrant workers is most concerned about whether they can share the same urban public service resources and the prospects of personal future development. "It's not hard to find a job in the city. The hard part is to take root here," said He Mingliang. He hopes his children can have a better living environment and a better future in the city. Luo Cheng, a researcher with the Shaanxi Academy of Social Sciences, believed that the issues of concern to young migrant workers will gradually be resolved with the reform of China's household registration system, equal urban and rural development, and the development of educational equality. Zhan Jianzhu, 59, decided to go back to settle in his hometown after 40 years spent outside as a migrant laborer.